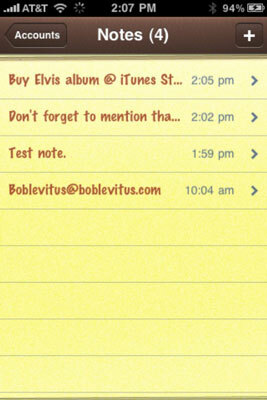 On your iPhone, Notes is an app that creates text notes that you can save or send through e-mail. You can create as many notes as you want on your iPhone and e-mail them to any e-mail account that includes a Notes feature. Tap the Notes icon on the Home screen. Tap the + button in the top-right corner to start a new note. 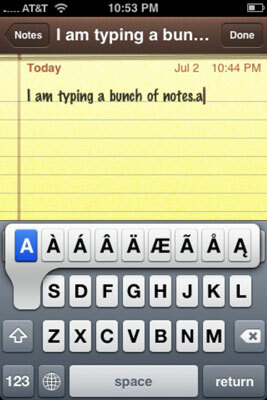 Type the note and, when you’re finished, tap the Done button in the top-right corner to save the note. The Done button appears only when the virtual keyboard is on-screen. Tap the left- or right-arrow button at the bottom of the screen to read the previous or next note, respectively. 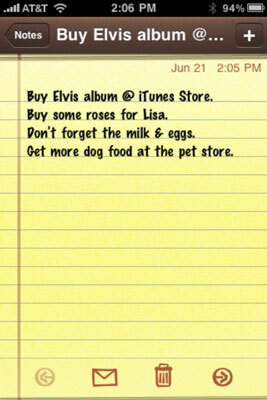 Tap the Notes button at the top-left corner of the screen to see a list of all your notes. Tap a note in the list of notes to open it for viewing or editing. As long as you’re running iPhone OS 3.0 or later, you can sync Notes with your computer. And if you’re running iOS 4 and have enabled Note Syncing for more than one account (such as a Microsoft Exchange, MobileMe, Gmail, Yahoo!, AOL, or other account that offers a Notes feature), an Accounts button appears at the top of the Notes list screen.